That was it. My boys weren’t at all interested in the process and ran off to do something, anything more fun than harvesting basil. We’ve been growing basil for a long time, and we always freeze some into cubes and make large batches of pesto to bring out in the winter. The boys have helped in the past, but for some reason this time around I couldn’t capture their attention; that is, until I brought out the hose. I figure if I’m going to rinse off all that basil—and there was a lot because I was cutting down the plants—doing it outside would make the job easier and the water could go back to the garden. Win win in my book. So I had the hose out and started showering the stems and pulling off the leaves, which went into a large colander at my feet. Instantly the boys were back, wanting to use the hose. And that’s when the water fight broke out. It started with just a few little flicks of water in their direction when they tried to grab the hose, then I started aiming for their feet. They wanted to play in the water, but I had a conference call coming up and needed to finish the task at hand, so we struck a deal. They had to help me clean up all the leftover stems and bad leaves, and if they did then I would squirt them. I kept rinsing basil and would occasionally squirt the boys, and it was good fun. They had a ball and got dripping wet, soaked through and through, and I got the basil harvested. 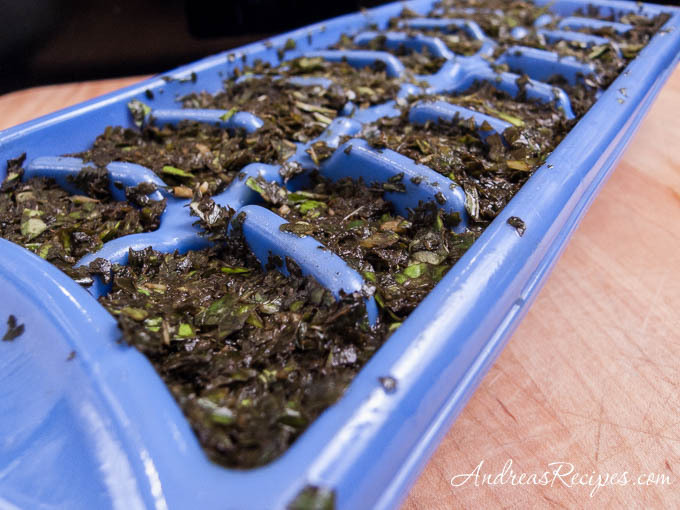 Freezing the basil in ice cube trays makes it easy to store and use. Once the cubes have frozen, just pop them out and put them in a large freezer bag. We toss the cubes into pasta sauce or soup. This is my contribution to Grow Your Own, a blogging event that celebrates the dishes we create from foods we’ve grown, raised, foraged, or hunted ourselves. We’re celebrating the first anniversary of Grow Your Own, and we hope you will join us! 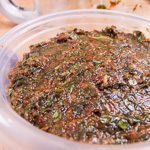 Just post about a dish you made using your homegrown foods by August 30. I’m hosting this anniversary event, and you can send entries to me at andreasrecipesgyo AT gmail DOT com. For more information on how to participate, visit the Grow Your Own page. 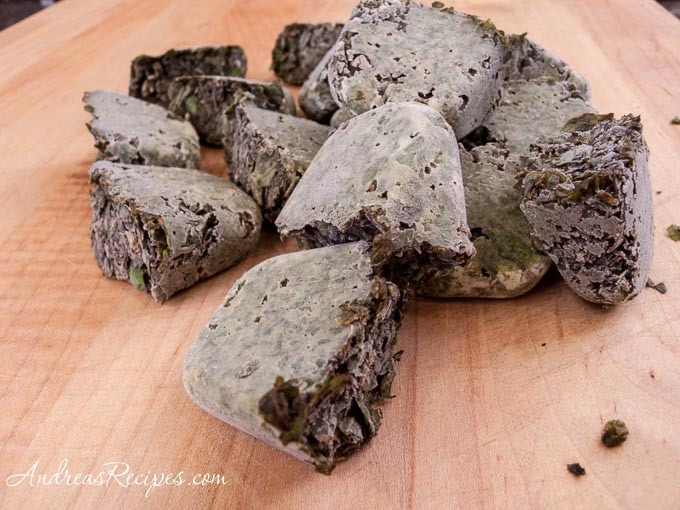 This is a brilliant idea – I never thought of freezing basil into cubes. We typically pick whole stalks and freeze them in bags, which makes them pretty easy to break up later. This is a great idea – I’ll have to try it! Yum! I have never frozen basil alone before. I DO make pesto and freeze it in batches. I just put it in zip baggies and flatten it out. Then I can just pull out a bag and put it in with veggies to saute or in with pasta. Great technique. Last year I froze them in baggies, like the above poster, and they got quite frostbitten, I’ll have to try your technique! I am really intrigued by the idea of freezing basil as I love this herb and hate to say good-bye to it every fall. I do successfully freeze pesto bit I have never been able to freeze basil. I read your instructions and am not sure whether you put basil leaves in the ice cube trays whole or cut up? Can you verify for me? Thank you so much! 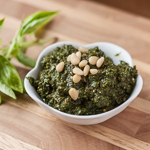 I also am going to try your pesto recipe, it sounds like a good one! Hi Anne. For freezing basil cubes, I process them in the food processor with some olive oil, then pack into the ice cube trays. Maybe there is just a bit of extra room for a stocked pond in your edible garden? I suspect your boys would say Yes! I love basil, too, and seek ways to store it; do you have any suggestions to prevent discoloring? Hi Lynda, thanks for stopping by. 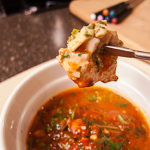 I’ve never worried about the discoloration of the basil cubes because I just toss them into a pot of sauce or soup. Now that being said, you could cover the ice cube tray with plastic wrap, pressing it down onto the basil. You have to work quickly to keep the top layer from darkening. Once the tray is frozen, pop out the cubes and then wrap each cube in plastic wrap before putting in the freezer bag. Hope this helps! How fascinating… I didn’t know that we have to add olive oil to the blend! Thanks for the cool tip!